This is a great recipe for a meatless dinner, or can also serve as a fun party appetizer. 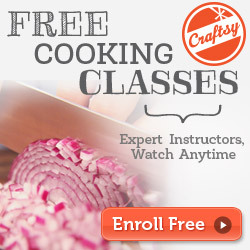 They are easy to make, but the results look like you worked really hard! If you prefer an egg roll with meat, you can add a bit of shredded chicken or pork. Heat oven to 400°. Heat oil in a wok or skillet. Add coleslaw, green onion and ginger and cook appx 3 minutes. Remove from heat and stir in oyster sauce. Place 2 heaping Tbsp of filling on the center of each wrap. Fold up starting with the bottom corner folded into the middle, turn in both sides, then wet the top corner and fold over to seal. Place rolls seam side down on a greased cookie sheet. Brush tops and sides of rolls with olive oil using either a pastry brush or your fingers. Bake 10-15 minutes or until starting to brown and crisp. As much as I love egg rolls I have never thought about making them myself. I always thought of them as a special out to eat treat. I thought they would be so much harder than this to make! I really love the Sweet and Sour Sauce recipe. I can use that over rice which I love! I love sweet and sour sauce.. I’ll keep your recipe for late use! Those egg rolls look awesome. What a delicious recipe, and I love sweet & Sour sauce too! It has been a while since I have had an egg roll. Now I want to try this recipe. Looks great! 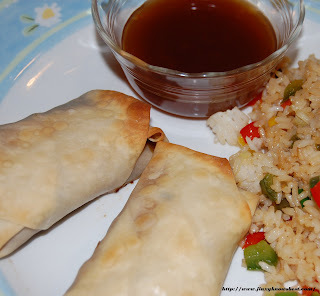 i have never made egg rolls before but these look doable! These look really good I love egg rolls and have never tried them at home. My husband would love this, thank you for sharing this recipe with us!